Water: Put a drop of milk on a polished slanting surface. The drop of pure milk flows slowly leaving a white trail whereas adulterated milk will flow fast without leaving a mark. Starch: Add a few drops of tincture of iodine or iodine solution. Formation of blue colour indicates the presence of starch in the milk. Urea: Take a teaspoon of milk in a test tube. Add half teaspoon of soybean or arhar powder to it. Mix up the contents thoroughly by shaking the test tube. After 5 minutes, dip a red litmus paper. If the paper turns blue, it indicates presence of urea in milk. Detergent: Shake 5-10 ml of sample with an equal amount of water. The formation of lather indicates the presence of detergent. 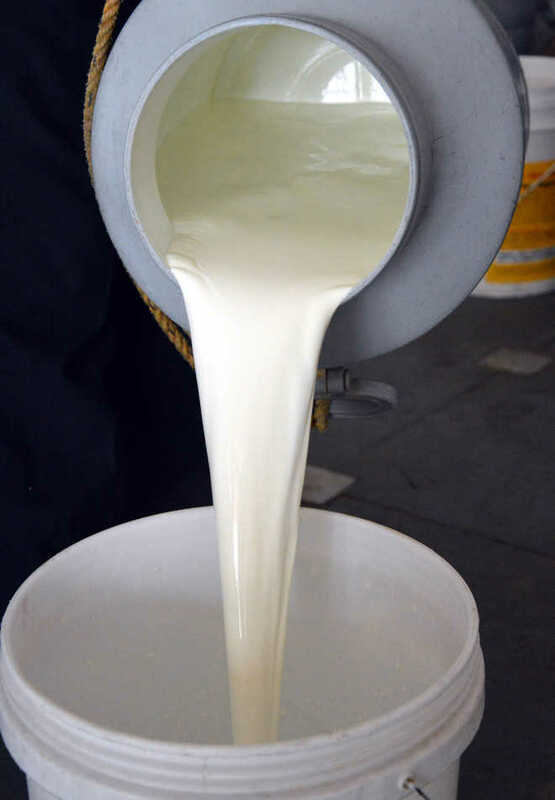 Synthetic milk: Synthetic milk has a bitter taste, gives a soapy feeling when it is rubbed between the fingers and turns yellowish on heating. Starch in “khoya” and “paneer”: Boil a small quantity of the product in water. Cool it and add a few drops of iodine solution. Blue colour indicates the presence of starch in it. Milk, which is considered an essential part of our daily diet, is the most adulterated commodity. A glass (250ml) of unadulterated whole milk gives us around 8gms of fat and protein, and 257mg of calcium, which make it an important part of a healthy diet for people of all ages. The benefits of milk include strengthened bones and improved cardiovascular and oral health. But adulterated milk and products made from it can lead to harmful effects on the human body. Milk is adulterated by adding water, removing cream, adding artificial colouring agents and preservatives such as formaldehyde, boric acid and other acids. “Milk adulterants have hazardous health effects. Detergent used in adulterated milk can cause food poisoning and other gastrointestinal complications. Its high alkaline level can also damage tissues and destroy proteins. Other synthetic components can cause various impairments, heart problems, cancer or even death. While the immediate effect of drinking milk adulterated with urea, caustic soda and formalin is gastroenteritis, the long-term effects are far more serious,” said a city-based gastroenterologist. Be cautious if your milkman claims that his milk has a long shelf life. Unscrupulous milkmen and dairy owners add chemicals such as hydrogen peroxide and formalin to milk to prolong its shelf life. These additives can enhance milk’s shelf life without refrigeration but are harmful to health. Is “matar paneer” or “shahi paneer” your favourite dish? Eat your favourite dish with care since paneer can also be made with the use of harmful chemicals such as urea. Khoya and paneer, two basic ingredients used to prepare delicious sweets, are often found adulterated.